T-STRIPE will increase comfort considerably, since your windows will not radiate cold anymore. According to studies a relative humidity of 45% – 65% is what most people prefer. Air always cointains some water, the amount of which naturally varies. Temperature is the deciding factor when it comes to vapours being contained in the air or condensing on surfaces. Air saturation is commonly defined at the point at which air at a given temperature contains the highest possible amount of water. When air heats up it can hold water. When air cools down it loses this attribute and relative humidity starts increasing. If air now comes in contact with a cold surface and the dew point is reached this way, then the surplus humidity in the air condenses on the surface. The dew point marks the temperature at which air in a room cooled down to the point of condensation appearing. During the colder seasons room temperatures sometimes can drop below the dew point. Knowing about the dew point is important because it helps deciding on where condensation can potentially occur and when it can occur. Refer to our infograph. Mold will not only ruin your view, it also is a serious health hazard. Mold can occur wherever condensation water accumulates. 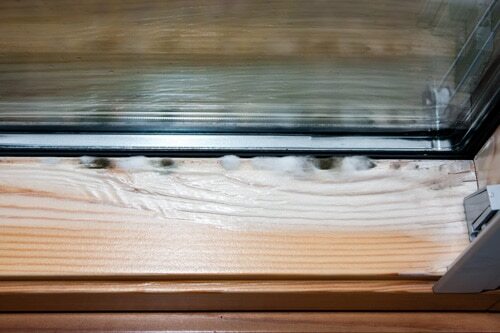 Mold can cover virtually any surface and usually appears in colours from black to blackish blue, blue, grey and green. Mold spores can already develop at 80% humidity. Mold should always be investigated, since it usually is an indicator of damage in a wall, a window or parts of the insulation. It occurs wherever humidity and dampness have accumulated over time and can have a variety of reasons; leaking pipes, bad air flow, wet walls etc. Different colorisation usually occurs whenever mold drains the surface beneath it of all moisture. Once the cause of the mold has been identified it can be easily removed with a brush. Before attempting to remove the mold it should be killed with a fungicide, else it will release spores into the air upon contact and therefore continue to contaminate the room. After the mold as been removed fungicides should be applied to the cleaned surfaces to prevent mold from resurfacing. A fresh layer of paint for example does not remove mold.